Three Note Ear Training Series develops your ability to modulate and hear three notes played either simultaneously or in succession. 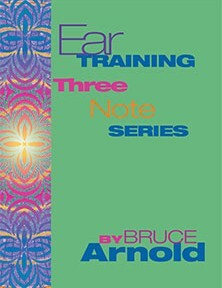 There are three different types of Three Note Ear Training Available in the Series. Ear Training Three Note Simultaneous. Ear Training Three Note Direct Application Arpeggiated Study. 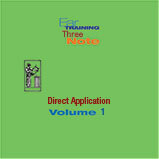 Ear Training Three Note Direct Application Three Note Simultaneous Study. Please note: The Three Note Ear Training Types listed should be practiced in the order listed above. Ear Training Three Note Simultaneous is consistent with the exercises found it the Two Note Ear Training Series but with three notes. Three Note Ear Training is done in the exact same way as Two Note Ear Training so no book is included. In some ways it’s easier because three notes define a key center easier than two notes. Five Volumes available. Get Ear Training Three Note Simultaneous…Volume One download today! Ear Training Three Note Simultaneous… Volume Two. Get Ear Training Three Note Simultaneous…Volume Two download today! Ear Training Three Note Simultaneous… Volume Three. Get Ear Training Three Note Simultaneous…Volume Three download today! Get Ear Training Three Note Simultaneous…Volume Four download today! Ear Training Three Note Simultaneous… Volume Five. Get Ear Training Three Note Simultaneous…Volume Five download today! Ear Training Three Note Direct Application Arpeggiated Study plays 3 note arpeggios 10 times with a 10 second gap between each repetition. A student can use these files to similate soloing over unknown changes. This is done by playing one note on your instrument after you hear the 3 notes. A student first distinguishes the key center of the 3 notes. Then using the one note ear training method identifies the three notes within the key. The remaining time is spent improvising over the 3 note arpeggiation which lasts about 2 minutes. The names of the notes are not given verbally on the track but the track name contains the pitches played. This is a great exercises for simulating improvising over chord changes without known what chord is next. These MP3’s use an acoustic piano sound and each example chooses three out of the 88 possible notes on the piano. Five Volumes available. Get Ear Training Three Note Direct Application Arpeggiated…Volume One download today! Ear Training Three Note Direct Application Arpeggiated…Volume Two. Get Ear Training Three Note Direct Application Arpeggiated…Volume Two download today! Ear Training Three Note Direct Application Arpeggiated…Volume Three. Get Ear Training Three Note Direct Application Arpeggiated…Volume Three download today! Get Ear Training Three Note Direct Application Arpeggiated…Volume Four download today! Ear Training Three Note Direct Application Arpeggiated…Volume Five. Get Ear Training Three Note Direct Application Arpeggiated…Volume Five download today! Ear Training Three NoteDirect Application Three Note Simultaneous Study plays 3 note simultaneously 10 times with a 10 second gap between each repetition. This series of Direct Application exerises should be used after working with the arpeggiated versions. The techniques used with this set of exercises is the same as the arpeggiated version. For example a student can use these files to similate soloing over unknown changes. This is done by playing one note on your instrument after you hear the 3 notes. A student first distinguishes the key center of the 3 notes. Then using the one note ear training method identifies the three notes within the key. The remaining time is spent improvising over the 3 note arpeggiation which lasts about 2 minutes. The names of the notes are not given verbally on the track but the track name contains the pitches played. This is a great exercises for simulating improvising over chord changes without known what chord is next. These MP3’s use an acoustic piano sound and each example chooses three out of the 88 possible notes on the piano. Five Volumes available. Get Ear Training Three Note Direct Application Simultaneous…Volume One download today! Ear Training Three Note Direct Application Simultaneous… Volume Two. Get Ear Training Three Note Direct Application Simultaneous…Volume Two download today! Ear Training Three Note Direct Application Simultaneous… Volume Three. Get Ear Training Three Note Direct Application Simultaneous…Volume Three download today! Get Ear Training Three Note Direct Application Simultaneous…Volume Four download today! Ear Training Three Note Direct Application Simultaneous… Volume Five. Get Ear Training Three Note Direct Application Simultaneous…Volume Five download today! This entry was posted in Ear Training and tagged guitar, aural comprehension, ear training, instrumental, piano, aural training, audio, listening, mp3, listening skills by Muse Eek. Bookmark the permalink.